Bullet Shutter locks are used to secure rolling garage doors as well as shop shutters. At Lockcentre we offer 5 different products from companies including 'Tessi' and 'Viro'. These locks come in a variety of finishes including brass plated, nickel plated and chrome plated to suit each individual taste. 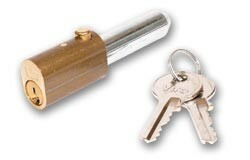 Each of the locks use a 'sprung locking pin' system also known as a 'bullet' locking system and can be depressed using keys that are provided within the purchase of the product.